This week was jam-packed with news, so instead of only talking about one story, I’m going to cover 4 of them. First: A new catfish from the Upper Eocene (56-33 million years ago) of Egypt. This [paper] was published by lead author Sanaa El-Sayed, who is now the first woman from the middle east to lead an international vertebrate paleontology paper. She describes the oldest marine catfish from the Eocene, which she named Qarmountus hitanensis (“the catfish from Hitan”). The specimen includes much of the head and the shoulders. It comes from a site called Wadi El-Hitan, which translates to the Valley of the Whales. Because it is only one specimen, we will need to find more before really understanding how it is related to other catfishes. Figure 2 from the paper showing the new catfish fossil. Second: A new fossil penguin from New Zealand. This [paper] describes the foot of a new penguin from the mid-Paleocene (66-56 million years ago). The size of the foot is larger than that of Waimanu, an extinct penguin the size of the modern emperor penguin (4 feet tall). Because it’s from the mid-Paleocene, it’s one of the oldest penguins known. Its giant size tells us that penguins became giant early in their evolution and stayed that way for 30 million years. Figure 1 from the paper showing the new penguin fossil. Third: The debate about Tully Monster continues. Last year I wrote about [this study] that said that Tully Monster had a notochord, making it a vertebrate. [This study] came out at the same time showing that Tully Monster has eyes like a vertebrate. The authors found that Tully’s eyes had melanosomes (pigment forming cells) in 2 layers. These 2 layers form a Retinal Pigment Epithelium (a fancy name for the cell layers that give the retina, which senses vision, nutrients). These layers are only found in vertebrates, lending more evidence that Tully is a vertebrate. Now a new [paper] contradicts the first study, and argues that the structures the authors found in the first study are also found in groups that aren’t vertebrates. The latest study does not say anything about the eyes, though, so there is still evidence towards Tully Monster being a vertebrate. Figure 1 from the paper showing the Tully Monster. Fourth: I’m writing a book with two colleagues (Abby West and Amy Gardiner)! Last week I launched a kickstarter project, called [She Found Fossils] to fund the publication of this project. The book is for children and it details the history women in paleontology, present diversity, and up-and-coming students. The book will be available in English and Spanish, and potentially some other languages depending on how much money we raise. Check it out! 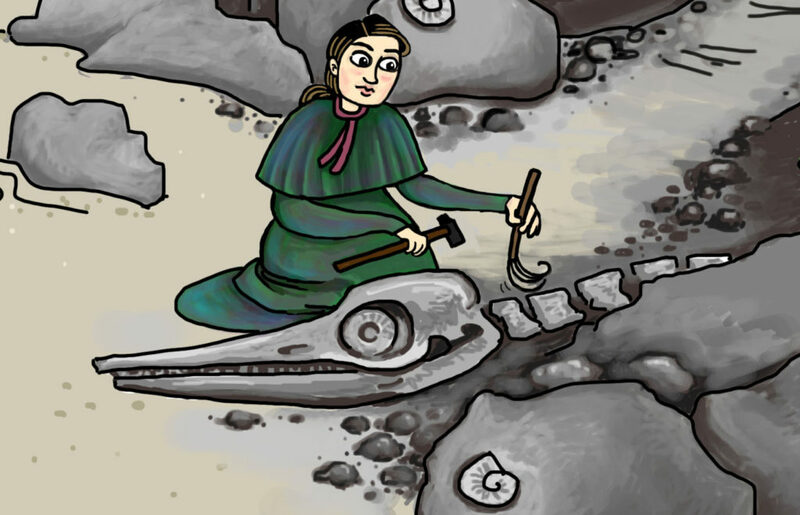 Original art from Amy Gardiner of Mary Anning.